By Tom Kertscher on Wednesday, September 28th, 2011 at 10:00 p.m.
Texas Gov. Rick Perry, a front-runner for the Republican nomination for president in 2012, rocked the race on Sept. 7, 2011 when, during a nationally televised GOP debate, he called Social Security a Ponzi scheme. Former Massachusetts governor Mitt Romney, another front-runner for the Republican nomination, quickly contradicted Perry and has attacked him for equating Social Security with an investment fraud. The debate was still crackling on Sept. 20, 2011, when conservative radio talk show host Laura Ingraham asked House Budget Committee Chairman Paul Ryan, R-Wis., where he stood. "What about the Social Security description of Rick Perry calling it a Ponzi scheme? Are you closer to what he has to say on that, or closer to Romney’s stance on that?" Ingraham asked Ryan. 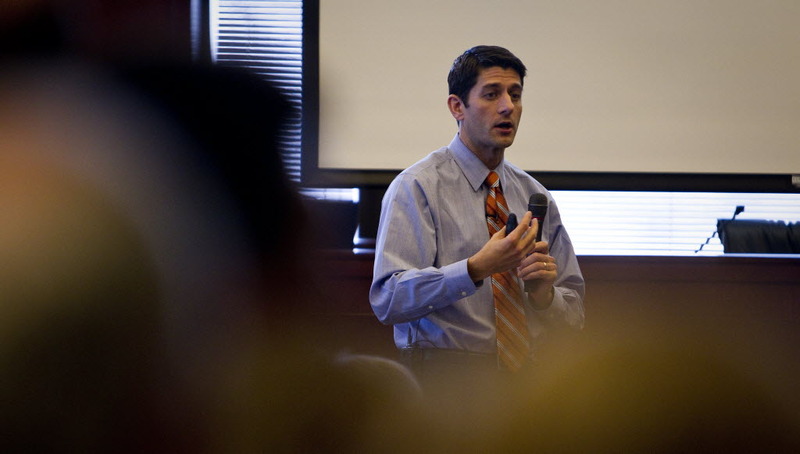 "No, they’re both right, I would say -- which is, it is not working," Ryan said. "It is going bankrupt and current seniors will be jeopardized the most by the status quo. And so, if you take a look at the technicality of Ponzi -- it’s not a criminal enterprise, but it’s a pay-as-you-go system where earlier investors or – say, taxpayers -- get a positive rate of return and the most recent investors – or, taxpayers -- get a negative rate of return." The debate does not easily fit the Truth-O-Meter. But since the Social Security-Ponzi comparison has come up before, we thought we would provide some perspective on it and what Ryan said. A Ponzi scheme is an "investment fraud that involves the payment of purported returns to existing investors from funds contributed by new investors," according to the U.S. Securities and Exchange Commission. The schemes "tend to collapse when it becomes difficult to recruit new investors or when a large number of investors ask to cash out." Perry’s calling Social Security a Ponzi scheme earned a False from PolitiFact National. Our colleagues cited Mitchell Zuckoff, a Boston University journalism professor who authored a book on Charles Ponzi, a Boston swindler who conned investors out of millions in 1920 by promising returns of up to 100 percent in 90 days on investments in foreign postal coupons. Zuckoff said Social Security is not a Ponzi scheme because, among other reasons, no one is being misled about how it works and Social Security is sustainable while a Ponzi scheme is not -- eventually the number of potential investors is exhausted. Now, back to Ryan’s comments. The same day his radio interview aired, the Democratic Congressional Campaign Committee, which helps Democrats try to get elected to the House, fired off a "breaking news" statement saying Ryan "stands with Perry, considers Social Security a Ponzi scheme." And the liberal Huffington Post reported that Ryan agreed with Perry’s Ponzi description. Traditional news outlets shared that interpretation. The Washington Post, in a story also carried by U.S. News & World Report, said Ryan agreed with Perry that Social Security is a Ponzi scheme. And The Hill, a newspaper that covers Congress, said Ryan "backed" Perry’s claim. Meanwhile, the conservative Weekly Standard said Ryan only suggested that some aspects of Social Security work like a Ponzi scheme. So, anyone who read news coverage of Ryan’s remarks, but didn’t hear his radio interview, could conclude that Ryan agreed with Perry. For his part, Ryan emphatically denies that he called Social Security a Ponzi scheme, said his spokesman, Conor Sweeney. Let’s look again at the two things Ryan said. The first part of Ryan’s reply to Ingraham was that both Perry and Romney are right about Social Security. Sweeney said Ryan meant Perry and Romney are correct, as Ryan said in the interview, that Social Security "is going bankrupt and current seniors will be jeopardized the most by the status quo." The second part of Ryan’s reply was that the "technicality of Ponzi -- it’s not a criminal enterprise, but it’s a pay-as-you-go system." Sweeney said Ryan meant Social Security is not technically a Ponzi scheme. But The Hill interpreted that part of Ryan’s remarks the opposite way, saying Ryan had said Social Security fits the technical definition of a Ponzi scheme. Clearly, it wasn’t clear to everyone what Ryan had said. Some news reporters thought Ryan had endorsed Perry’s claim that Social Security is a Ponzi scheme. But Ryan never said so directly. And his references to Perry being "right" and to the "technicality" of a Ponzi scheme are open to interpretation. We asked a linguist, Marquette University director of business communication courses Tracey Weigel, for her take. "This is a tough one. He initially says, ‘They are both right,’ which would very easily lead the listener to lock in and think, ‘He thinks Social Security is a Ponzi scheme,’" Weigel said. "We are lazy communicators both in listening and speaking, so I can see how listeners would go there. However, when I look at the text, he tries to say how it also isn't like a Ponzi scheme, but never quite makes it clear." We also spoke with Charles Franklin, a University of Wisconsin-Madison political scientist. He said he Ryan’s comments underscore how volatile it can be to question the soundness of Social Security and suggest changes to such a venerable program. "The trick for any politician, but especially a Republican," Franklin said, "is to talk about the changes to fix the Social Security imbalance without being a lightning rod for attacks."